​I have a feeling that if scientists ever took a picture of my brain while "crafting", it'd look like all those giant pictures of the sun in science books - constant eruptions (solar flares and plasma for all of you with kids in school) and BRIGHT spots every where. Of course, I think that's what it would like while parenting or training puppies . . . they'd probably return my brain to me and say, "We're sorry, Mrs. Kelley, it's broken and we can't fix it!" Crafting is my overall term in the Kelley house for all things creative that I attempt and teach myself to do. To fully understand the depth of meaning in that term, you'd have to speak to my husband about the state of my supplies. "Waste not, want not" made it to my generation and I have bins full of just about anything you can imagine and yes, I literally have a huge burlap sack of prime sheep wool, hot off the ram, so to speak. For those of you with Goldens in the house, you know what I mean. Those piles of fur you sweep up when they're blowing their coat make it look like you've murdered some poor fur-fairy and spread the fluff all over your floor. Did you know you're sweeping up chiengora? 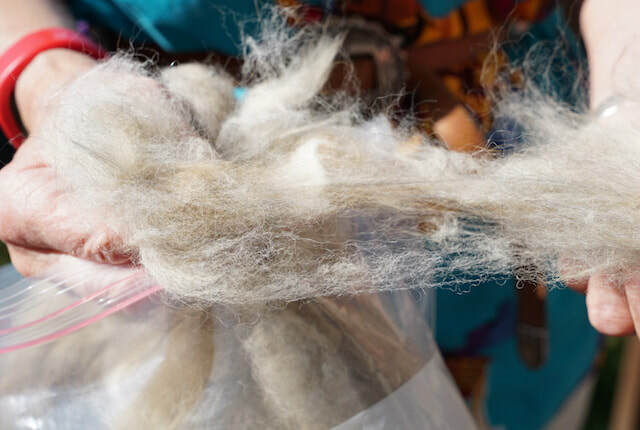 It's a word primarily used to describe yarn spun from dog hair, but has also been more broadly used to describe things created from dog fur. To a self-taught knitter of 20 years, this was a whole new world for me! 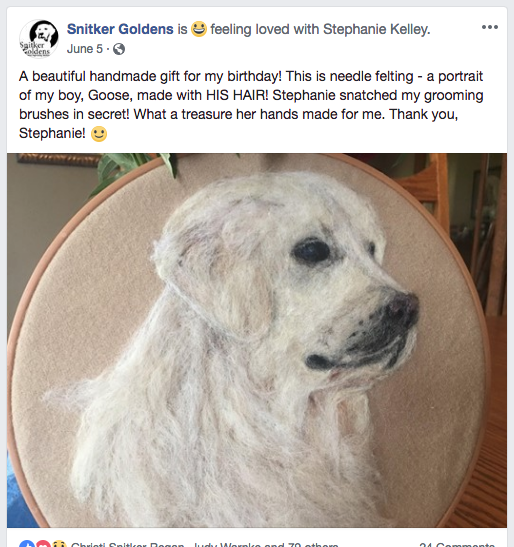 I have worked with baby alpaca fiber, prime sheep wool, and yes, the cheap acrylic yarn from Wal-Mart that's indestructible in its cheapness, but I had never worked with dog fur before. It is unbelievably soft. No wonder Golden Retrievers look amazing when they're all blown dry and combed out. My latest hunt for something new to learn accidentally dropped me into the world of needle felting. 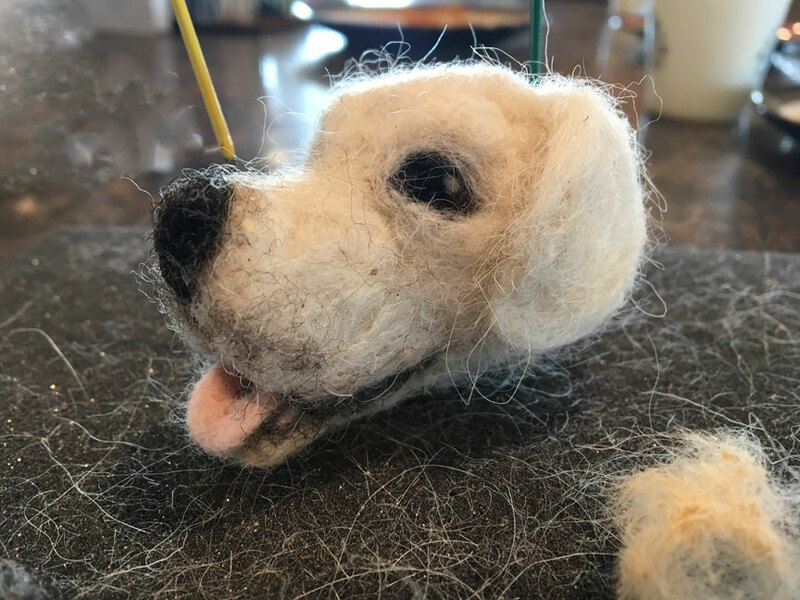 Needle felting literally consists of poking a lump of wool with a barbed needle. I had no idea they did this with dog fur . . . I had no idea they did this period! Did you see Rhonda's Facebook post not too long ago in June? 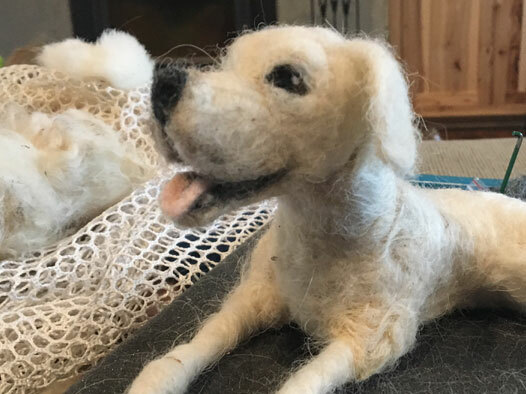 That was my first attempt at both needle felting and working with dog fur. I bought some barbed needles (already stabbed my fingers a few times - they need a disclaimer "points are sharper than they appear"), studied quite a few photos online, and groomed Goose. Unique and unforgettable birthday gift - check. Wow. So. Much. Fun. and incredibly life-like. Plus, it does not stink. It's like any other luxury fiber when washed. Lovely. 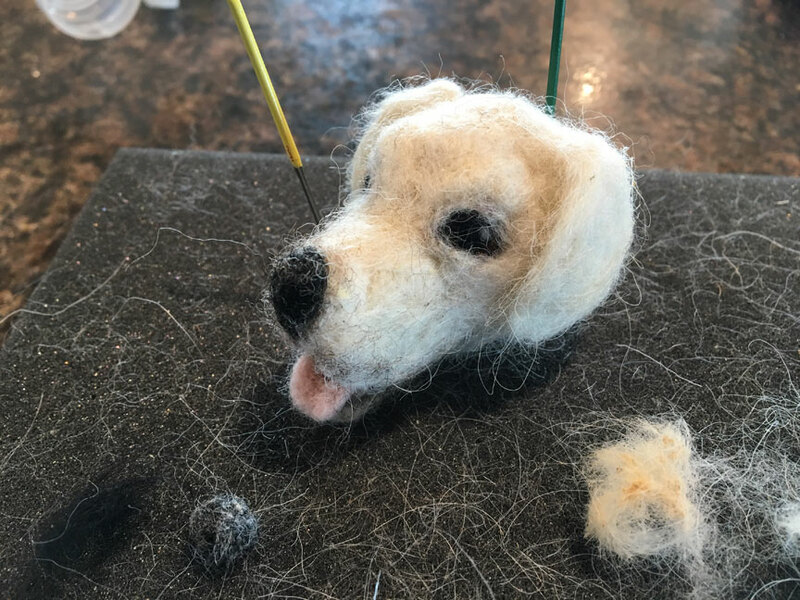 I started my first 3D needle felting sculpture this past week. Would you like to see? I haven't added the actual dog hair yet and it's still in the sculpting stage, so no judgement. ;) I'm rather fond of this little guy already though. It will be challenging and exciting to give him his Golden coat! In case you missed it, we just opened up our Fall 2018 and Winter 2018 puppy reservations. 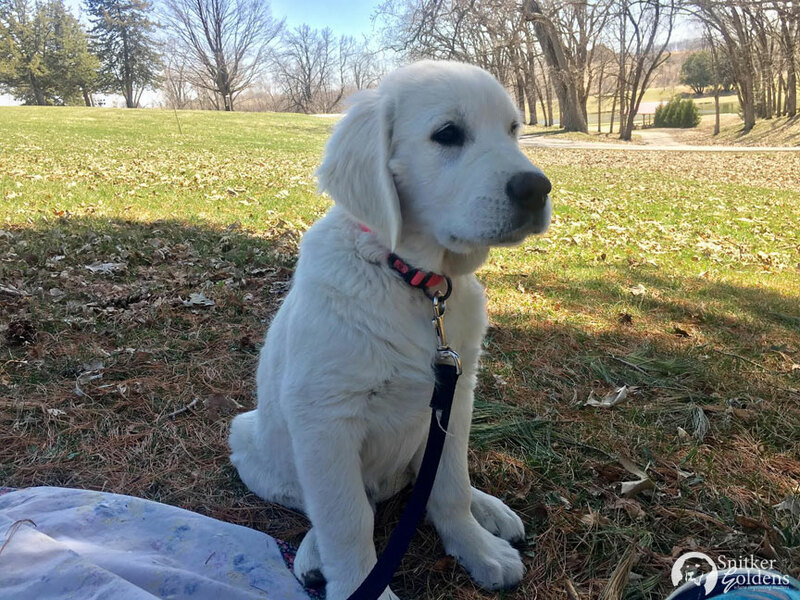 Check out what we have available here on Our Puppies page. We also have some exciting things coming up, so stay tuned with our newsletter. We blinked and all of the sudden...our little girl is ready for class! Harper is a sweet, sweet soul, though it's no surprise because her mother is one too. :) We're lengthening the sit-stay and down-stay now and will be working towards her AKC S.T.A.R. Puppy distinction just like pups in the Gold Select program. 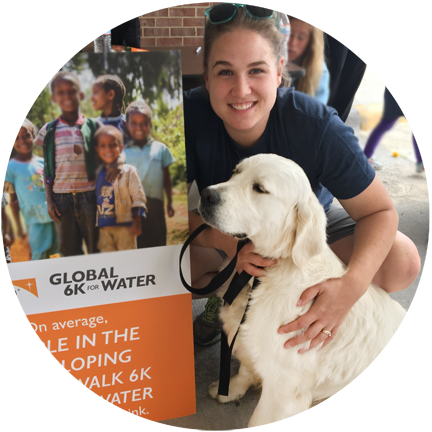 Puppy Class officially starts in a few weeks, so we'll be taking her (and Evie, an Oakley/Silas daughter) on the road for some great training experiences with our favorite folks at the Good Dog Center. Harper and her siblings are hitting the end of the critical learning period soon, so we're wrapping up the baby stage and heading into the teens. One of the books I've been reading through lately is "Genetics and the Social Behavior of the Dog. A Classic Study". It's a real mouthful, but it's full of great information. Yep. They got that part right! We call this the gangly stage for our pups because they're all legs and feet. 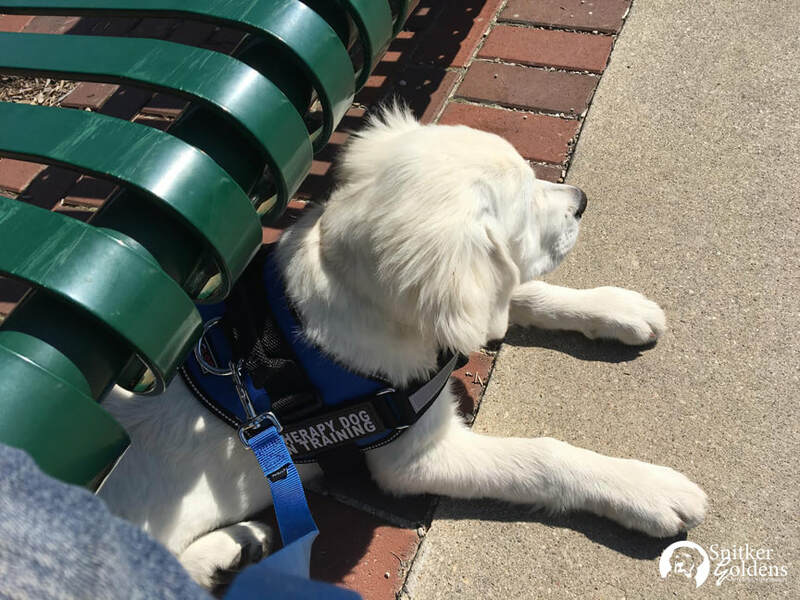 The scary part is that around 12 weeks of age, the imprinting window starts closing - rapidly - so your puppy is going to respond in the future to their environment by how and where those building blocks are being placed now. While it's not the easiest of reading, if you're interested in genetics and a 20 year research project that radically changed how we look at canine development, this is the book. ​Just be prepared to wade through a lot of tables and graphs. In other words - you are the key to your puppy's success. ​Use this time wisely! Scott, J. P. and Fuller, J. L. (1965) Genetics and the Social Behavior of the Dog. Chicago, Illinois: The University of Chicago Press.